Seeds and nuts aren't supposed to make up a huge part of the grain free diet (they are a little harder to digest for most people) but they're great for guacamole, and any other dip! They're also delicious on their own. 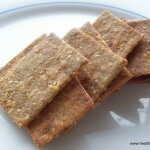 Grain free crackers are easy to make in the food processor, and without gluten we don't have to worry about over processing them making them tough. In the bowl of the food processor, using the regular metal blade, combine the sunflower seeds, salt, and garlic. Turn food processor on and let it whir for 2-3 minutes until the seeds have turned into a dense flour. Add in the sesame seeds and pulse to mix (the sesame seeds don't need to mix all the way in). Slowly add in the water, a couple tablespoons at a time, until the seeds all clump together in a ball. Remove and knead to distribute the sesame seeds through the sunflower seed mixture. The mixture isn't a very pretty color at this point, but it improves beautifully with baking. Between parchment paper, roll the dough out until it is very thin for crisper crackers, or up to 1/4 inch thick for more sturdy crackers, in as close to a rectangle shape as possible. Using the parchment paper, flip the whole rectangle of dough onto a cookie sheet, keep the crackers on a layer of parchment paper to bake for easy removal. Cut into rectangles with a pizza cutter or sharp knife. We'll use the cut lines to break the crackers on after they're cooked.